WHEN WE THINK OF RAILROADS, many of us think of the flat areas where we see them most often. Whether it's the golden rails disappearing to the horizon, or the winding route that follows the water's edge, or the busy yards and terminals, we seldom think of the tortured path that railroads must follow to get through the mountains. Perhaps the best known of these crossings in the northwest is Stevens pass where the Great Northern Railroad breached the barrier of the Cascade mountains in order to reach the shores of Puget Sound. The Great Northern is gone, merged out of existence in 1970 to form the Burlington Northern and diluted further with the BNSF merger in 1996, but here in the land opened by this great railroad, and in the towns it created along the way, the spirit of the GN and of it's mascot Rocky, lives on. We begin our journey over Stevens pass in the fertile valley of the Snohomish river, which the tracks will follow a tributary of all the way to their headwaters. Even here in the gentle valleys among the farms and dairies you can tell that this is a special place. All around us are towering peaks rising to the sky, many of them covered in snow all year round. We pass through Monroe, the last habitation that can claim the description "city" along our route. Monroe was once the site of the Great Northern Railway's botanical gardens where fresh flowers for their passenger trains were once grown. Each day these flowers would be loaded aboard the Western Star for distribution throughout the system so that each dining car passenger might have fresh flowers with their meal. Just west of the town of Sultan there is a small roadside chapel where travelers can stop and pray for good fortune on the trip ahead (equally important is an outhouse so travelers may prepare in other ways!). Near the little chapel is a wide pullout on the road where this shot was taken. One can imagine what the view must have been like when the roaring of the diesels was replaced by the measured tempo of thunder from a 4-8-4 Northern steamer or in place of the container platforms rode the great domes of the Incomparable Empire Builder. Passenger trains still roll past this promontory, but the modern Amtrak schedule pales in comparison to the GN's two Empire Builder, two Western Star and two Cascadian schedule with extra sections as needed. Stevens Pass is named for John F. Stevens, the famous surveyor and engineer of much of the Great Northern Railway. In addition to surveying the line over the pass that now bears his name, he also discovered the GN's crossing of the Rocky Mountains at Marias pass. The first Great Northern train arrived in Seattle in 1893 by way of a series of switchbacks over Stevens Pass. It wasn't until 1900 that the first Cascade tunnel was completed by blasting through 2.63 miles of rock. This tunnel was the first permanent Stevens pass line and eliminated the switchbacks and nearly 700 feet of vertical elevation. In 1909 the Stevens pass line was electrified and electric locomotives continued to lift trains over the summit until 1956 when the wires came down. Today, diesels dominate the majestic pass and their cargo is almost exclusively containers and trailers in long stack trains to and from the east. 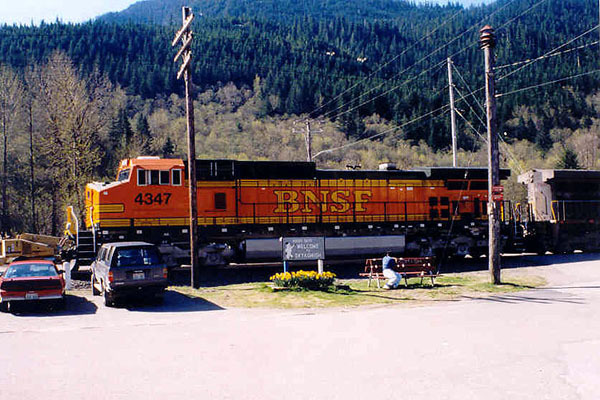 After the Burlington Northern merger in 1970 the Stevens Pass line carried much of the manifest freight between Puget Sound and the eastern markets. 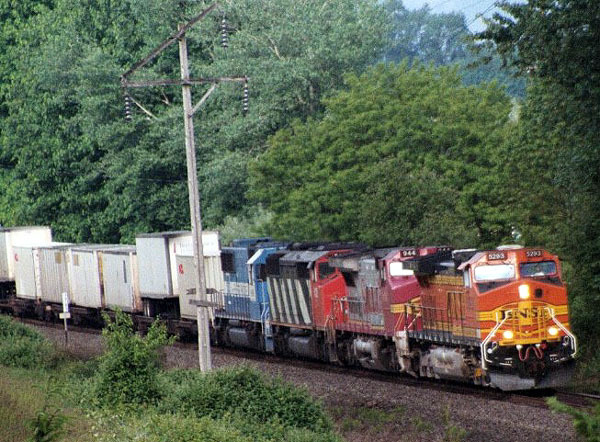 With the intermodal boom in the early 80s, the manifest traffic was shifted to the former SP&S Columbia River line and the shorter pass route became almost exclusively an intermodal line. The hottest trains on the BNSF such as the Chicago - Seattle and Chicago - Tacoma "Z" trains run over the pass in order to trim precious hours en route to their destinations. The last bastion of civilization on the western side of the pass is the little town of Skykomish. Beyond Monroe, Sultan, Goldbar, and Startup, there is Skykomish. Quaint, and sort of touristy as it may be, there is no mistaking it for anything but a railroad town. 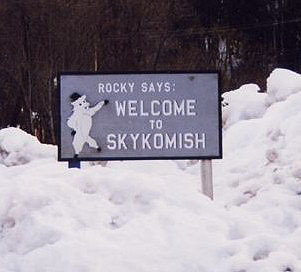 Skykomish was created by the railroad as a base for construction crews and later became the western end of the electrified district on the GN. Here the class W and Y electric motors, with their hissing heater cars, were cut off, and the steam locomotives took over for the remainder of the trip to Seattle. In the diesel era, the power was left on the trains, and rode dead-in-tow over the pass to prevent the buildup of fumes in the tunnels. Even after the end of electrification in 1956, Skykomish continued on as a helper base, and as a crew change point into the early 80s. Today, it serves as a maintainance base, and occasionally helpers are still stationed here, though with the advent of Distributed Power technology this has become less common. For the railfan, Skykomish has most of the things necessary for a successful day. It's the last gas until Leavenworth on the east side of the mountain, and offers food and some great places to watch trains. As you might imagine, the weather in the Cascade Mountains is often not favorable for railroading. Freezing temperatures, blowing snow, landslides and washouts all keep the maintainance of way crews busy on the pass. 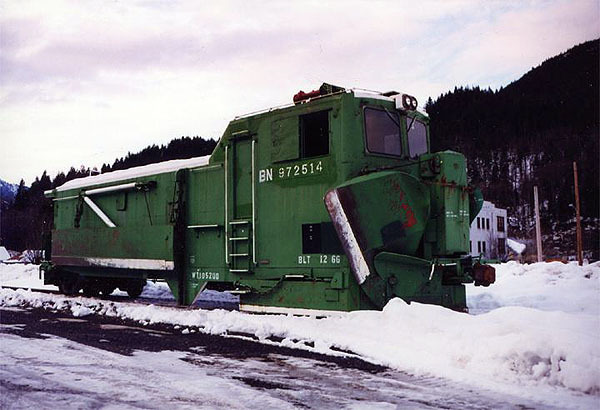 Every fall the BNSF deploys a fleet of spreaders, icicle breakers and snow dozers such as this one to points along the line in order to keep the trains moving. Miles of slide fences are installed along the right of way to warn crews of washed out track and to prevent derailments. Even with these herculean efforts, it's not uncommon for the line to be closed due to weather related incidents at least once each winter. And so at last we reach the summit. Located 17 miles beyond Skykomish is the western portal of the new Cascade tunnel. Construction of the new tunnel was begun shortly after the completion of the first Stevens pass route in 1900, but wasn't completed until 1929. A new 7.9 mile tunnel was bored, becoming the longest tunnel in the western hemisphere. The new tunnel reduced the maximum elevation along the line to 2,881 feet and allowed the removal of miles of curvature and snowsheds. Just west of the tunnel a new siding was built at Scenic where eastbound trains wait for the tunnel to be cleared of fumes before entering. rocky says "brrr i'm cold!" To reach the west portal of the tunnel take highway 2 east past Skykomish approximately 15 miles. Just past the DOT gravel storage site there will be a road off to the left immediately before a bridge. This is the old Highway 2 and though the road has been abandoned, you can still drive over it if you're careful. About half a mile from the main road there is a steep dirt road to the right that ends at the tracks where these pictures were taken. If you continue up the old road you can get on top of the tunnel portal, which makes for some interesting shots. One note of caution though, there is a very deep ditch near the tracks and if you get stuck in it it's a long ways to go for help. Yes, that is the voice of experience talking. If you've spent a lot of time around diesel engines you know that it doesn't take very long for them to fill the air up with smoke and fumes. Now take four or five hard working locomotives and put them in an almost 8 mile long tube and it gets pretty unpleasant in a hurry! In the early days of the Cascade tunnel this wasn't a problem, the electric locomotives didn't generate any fumes and the little stoves in the cars put out relatively little smoke. When electric operation was discontinued the GN installed large fans at the east end of the Cascade tunnel to blow the fumes out of the bore. When a train clears the east portal the doors there close behind it and the fans are activated, creating a frequently impressive show at the western portal. Due to the great length of the tunnel, special equipment and procedures have been created to protect crews in the event of an incident in the tunnel. Railfanning on Stevens pass is a wonderful experience and one I strongly recommend to anyone seeking a new adventure. Perhaps the most interesting feature of this area is how it can take the trains we see every day and by changing the background make them magical again. Unlike many places, a trip to Stevens pass where you never see a train is still a trip worth taking. The mountains and water set it so apart from our normal surroundings, that you truly feel as if you are in another world. In this remote and rugged region of the Northwest, the spirit of Rocky and the Great Northern Railway can still be felt, not only in the roar of modern trains over the pass, but also in the towns and indeed in the people. Have a question or opinion on this story?